A novel method of sample preparation was developed to accommodate cell and tissue coculture to detect small molecule exchange using imaging mass spectrometry. Zink, K. E., Dean, M., Burdette, J. E., Sanchez, L. M. Capturing Small Molecule Communication Between Tissues and Cells Using Imaging Mass Spectrometry. J. Vis. Exp. (146), e59490, doi:10.3791/59490 (2019). Imaging mass spectrometry (IMS) has routinely been applied to three types of samples: tissue sections, spheroids, and microbial colonies. These sample types have been analyzed using matrix-assisted laser desorption/ionization time-of-flight mass spectrometry (MALDI-TOF MS) to visualize the distribution of proteins, lipids, and metabolites across the biological sample of interest. 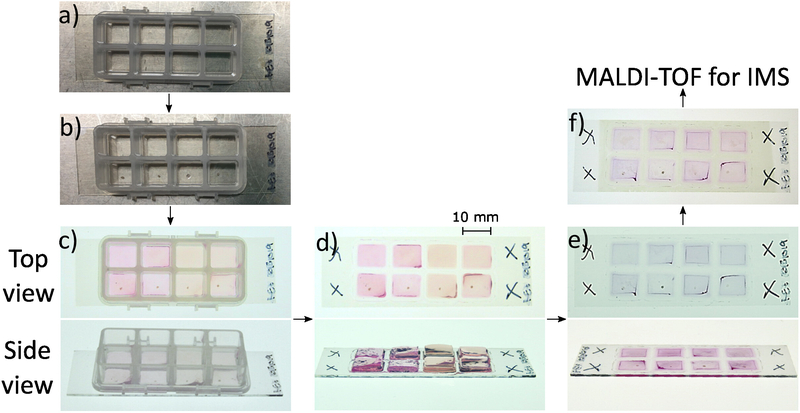 We have developed a novel sample preparation method that combines the strengths of the three previous applications to address an underexplored approach for identifying chemical communication in cancer, by seeding mammalian cell cultures into agarose in coculture with healthy tissues followed by desiccation of the sample. Mammalian tissue and cells are cocultured in close proximity allowing chemical communication via diffusion between the tissue and cells. At specific time points, the agarose-based sample is dried in the same manner as microbial colonies prepared for IMS analysis. Our method was developed to model the communication between high grade serous ovarian cancer derived from the fallopian tube as it interacts with the ovary during metastasis. Optimization of the sample preparation resulted in the identification of norepinephrine as a key chemical component in the ovarian microenvironment. This newly developed method can be applied to other biological systems that require an understanding of chemical communication between adjacent cells or tissues. 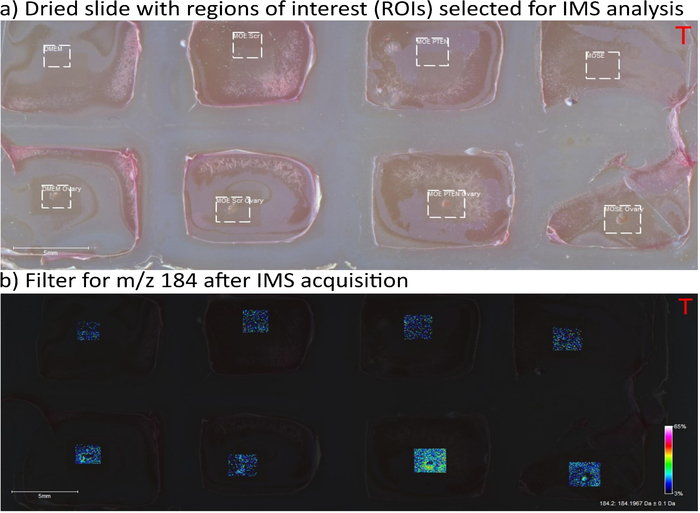 Imaging mass spectrometry (IMS) has been optimized to characterize the spatial distribution of molecular features in three widely used applications: tissue slices, spheroids, and microbial colonies1,2,3. Tissue slices can be used to evaluate the localization of metabolites in the context of biological conditions in a host, either targeted or untargeted within a specific mass range. However, differences between molecular features are the most significant and obvious when a healthy tissue is compared to a diseased condition, for example, a tumor. This IMS approach is particularly adapted to detection of disease biomarkers, however, acquiring tissue samples at discrete stages in disease progression (such as tumor grades) precludes the identification of signals that could be important for initiation of the disease. The exchange of information through space is a ubiquitous feature of many biological systems, and tissue slices cannot capture this dynamic chemical relay. One technique that is capable of visualizing chemical exchange and diffusion is IMS of microbial colonies grown on agar plates; small molecules are able to diffuse through and across the agar and can be captured via matrix-assisted laser desorption/ionization (MALDI-TOF) mass spectrometry4. This growth setup can be used to identify molecules exchanged between discrete biological entities (colonies) and can also determine directionality of metabolite production. The platform originally designed for microbial colony growth was adapted to explore the primary metabolism of tissue explants grown with mammalian cells, and IMS was used to evaluate the dynamic chemical exchange in an in vitro mammalian system. In the past several years, it has become clear that high grade serous ovarian cancer (HGSOC) often originates in the fallopian tube epithelium (FTE) and then metastasizes to the ovary during early disease development5,6,7,8. The reason that tumorigenic FTE cells spread to the ovary, where large tumors eventually form and metastasize further, is currently unclear. Previous research has focused on the role of ovarian proteins in primary metastasis to the ovary; however, it has recently been demonstrated that the transition from a healthy to a tumorigenic tissue results in massive disruption of cellular metabolism and alters production of small molecules9,10,11. Therefore, we hypothesized that small molecules exchanged between the FTE and the ovary may be partly responsible for primary metastasis of HGSOC. Using our newly developed IMS procedure, we have determined that coculture of tumorigenic FTE and healthy ovarian tissue induces the production of norepinephrine from the ovary. However, other cell types or normal FTE cells did not elicit this effect. An extraordinary benefit of this method is that the molecular production and exchange of signals that represent real molecules can be visualized, so even in a coculture it is possible to determine the source of a signal. This is an advantage over analysis of homogenized samples, where all spatial information is lost. In our model system, we were able to clearly assign the production of norepinephrine to the ovary. Norepinephrine has been linked to the metastasis and chemoresistance of ovarian cancers, and our detection of this molecule has validated that the novel IMS method can uncover biologically relevant molecules12,13,14. This validation lets us propose that this new application of IMS can be particularly helpful to research groups that are attempting to identify small molecules in coculture environments and to understand early events that influence cell transformation and metastasis. 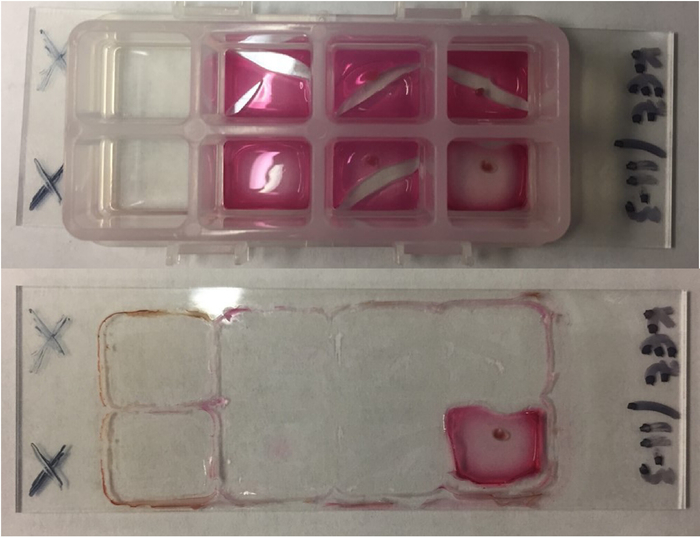 The overall goal of this method is to elucidate the identity and spatial distribution of small molecules during exchange between tissues and organs, represented either by in vitro 3D cell cultures or ex vivo tissue. All animal procedures were in accordance with the National Institutes of Health Guidelines for the Care and Use of Laboratory Animals and approved by the Institutional Animal Use and Care (IACUC) committee at the University of Illinois at Chicago. Maintain murine oviductal epithelium (MOE) cells at 37°C with 5% CO2 in a humidified incubator in alpha Minimum Essential Medium (αMEM) media supplemented with 10% fetal bovine serum (FBS), 2 mM L-glutamine, 10 mg/mL insulin, transferrin, selenium (ITS), 1.8 ng/mL epidermal growth factor (EGF), 100 U/mL penicillin-streptomycin, 1 mg/mL gentamycin, and 18.2 ng/mL estradiol-17β. Pass the cells every 3–4 days, ensuring there are enough cells on the same day the mice will be sacrificed. Prepare 2% agarose by mixing 1 g of low-melting agarose with 50 mL of distilled water. Autoclave the agarose, allow to cool, and then aliquot (1 mL) in 2 mL tubes (see Table of Materials) before agarose solidifies. Agarose can be stored at -20 °C indefinitely. Prepare at least 2 mL of 1x Dulbecco’s Modified Eagle’s Medium (DMEM) media. For the matrix for MALDI-TOF MS, prepare 10 mL of 5 mg/mL 1:1 alpha-cyano-4-hyroxycinnamic acid (CHCA):dihydroxybenzoic acid (DHB) (see Table of Materials) in 90:10 ACN:H2O + 0.1% trifluoroacetic acid (TFA). Sonicate solution until matrix is dissolved. Maintain breeding pairs of CD-1 mice using standard housing procedures. Near the day of parturition, check the mice every day so that the age of the pups is known. Euthanize pups at 16–18 days of age by CO2 inhalation per NIH guidelines. Deliver CO2 (100%) at a flow rate of 10%–20% chamber volume per minute and continue for two minutes after respiration had stopped. Confirm euthanasia by cervical dislocation. Disinfect all surgical equipment by submerging in 70% ethanol. Warm Leibovitz’s L-15 media with 1x penicillin-streptomycin to 37 °C. Wet the abdominal surface with 70% ethanol to disinfect the area and minimize contamination with hair. Grasp the skin covering the abdominal wall using blunt forceps and use surgical scissors to make a large V-shape cut through the skin and abdominal wall, exposing the internal organs. Move the internal organs to the side using forceps. Individually grab each uterine horn with fine forceps and lift slightly. Locate the ovary, which will be at the end of the uterine horn, immediately below the kidney. Use surgical scissors to dissect the ovary free of connective tissue. Then, cut the ovarian horn in half. Move the ovary, oviduct, and approximately one half of each uterine horn to pre-warmed Leibovitz’s L-15 media. Under a dissecting microscope carefully move each ovary from the surrounding bursa, freeing it from the oviduct, bursa, and any adipose tissue. Move each ovary to a new dish of Leibovitz’s L-15 media. Cut each ovary in half axially. Keep the ovarian pieces (now called explants) kept at 37 °C until plating of agarose. Liquify the agarose at 70 °C on a hot plate. Place the 8-well divider on top of the indium tinoxide (ITO)-treated slide (Figure 1A). The rubber bottom on the divider aids in adhesion to the slide, but make sure to apply continuous gentle downward pressure during agarose plating to ensure no leaking or mixing between wells. Collect cells in a 15 mL conical tube, centrifuge (5 min at 800 rpm), and resuspend to 50k cells per 150 µL in 1x DMEM media. If a different cell density is optimal, make sure that at this step the cell suspension is 2x the final density desired (e.g., for a final concentration of 50,000 cells in 300 µL, cell density at this step is 50,000 cells in 150 µL). Before plating cell culture, add ovarian explant to center of well (Figure 1B). Add agarose to each cell culture in individual 2 mL tubes just before plating. For each well, combine 200 µL of cell suspension and 200 µL of liquified agarose in a 2 mL tube. For example, for four wells, combine 800 µL of cell suspension and 800 µL of 2% agarose. Some mixture will be left over, but making slightly more than necessary avoids air bubbles during pipetting. Add agarose to individual cell cultures immediately before plating that cell culture. The agarose will cool in under a minute, so be prepared to plate quickly. Immediately add 300 µL of the cell/agarose mixture to each well (Figure 1C). Figure 1C shows three cell conditions and one media condition, each plated with and without an ovary. Incubate slide at 37 °C and 5% CO2 in a humidified incubator. Cut dividers from thin, smooth plastic (Figure 2A). NOTE: This experiment uses the sides of a sterile disposable media basin because they are flat and thin. Cut them just wide enough to fit snugly into the hypotenuse of the well (~13 mm). Place the 8-well divider on top of the ITO-treated slide (Figure 2B). The rubber bottom on the divider aids in adhesion to the slide, but make sure to apply continuous gentle downward pressure during agarose plating to ensure no leaking or mixing between wells. Collect cells in a 15 mL conical tube, centrifuge (5 min at 800 rpm), and resuspend to 50k cells per 150 µL in 1x DMEM media. If a different cell density is optimal, make sure that at this step the cell suspension is 2x the final density desired (e.g. for a final concentration of 50,000 cells in 300 µL, cell density at this step is 50,000 cells in 150 µL). Insert plastic dividers diagonally into wells (Figure 2C). Add agarose to each cell suspension one at a time just before plating. For each well, combine 100 µL of cell suspension and 100 µL of liquified agarose in a 2 mL tube. For example, for four wells, combine 400 µL of cell culture and 400 µL of 2% agarose. Some cell/agarose mixture will be left over but making slightly more than necessary avoids air bubbles during pipetting. On one side of the divider, plate 150 µL of cell/agarose mixture. Allow agarose to cool and solidify (approximately one min) and then remove the divider (Figure 2D). Place ovary explant in the center of the empty half of the well. Place 150 µL media/agarose mixture over top of the ovary, and only in the correct side of the well (Figure 2E). After four days (or any preferred time point), remove the chamber divider from the agarose plugs and the slide (Figure 1D). Gently detach the sides of the agarose from the chamber with a flat spatula and gently pull the chamber upward, being careful not to move any agarose plugs. If they do move, gently reposition them so that they are not touching one another. Place the slide in a 37 °C oven for approximately 4 h, rotating 90° every h.
NOTE: The rotation of the slide is important to ensure even heat distribution throughout the sample. Once dry, remove the slide from the oven (Figure 1E). Apply matrix solution using the sprayer (Figure 1F), with the following parameters: temperature = 30 °C, flow rate = 0.2 mL/min, number of passes = 8, direction = CC, and nozzle distance = 40 mm. NOTE: In lieu of a matrix sprayer, an artistic airbrush can be used to apply liquid matrix. The same matrix solution can be used to spray, but approximately twice as much solution is required. With the slide clamped so that it hangs vertically, spray the slide from a 90° angle from approximately one foot away (Adapted from Hoffmann15) until the matrix layer is visible. Add 1 µL of calibrant (Phosphorus Red for targets <500 Da, a peptide mixture (see Table of Materials) for targets <5,000 Da) to clear spot on slide. Phosphorus Red requires no mixing with matrix, but the peptide mixture requires 1:1 mixture with matrix to aid ionization. Wait for calibrant to dry. Draw an X using a permanent marker in each corner of the slide and take an optical image using a camera or a scanner at 1,200 dpi. Open a new sequence on the IMS data analysis software (see Table of Materials). Set the raster width to desired spatial resolution, at least 50 µm. Upload the optical image of the slide to the analysis software and set three teach points using the intersections in the X’s drawn in each corner. Designate regions of interest for imaging in the acquisition software and name them accordingly. Calibrate the instrument using the data acquisition software (see Table of Materials) within 5 ppm error. Save the optimized method and begin run. This experiment optimized the following parameters: Polarity = Positive, Detector = Reflectron, Laser size = 2, Laser power = 50%, Reflector mode detector gain = 3x. Import .mis file into statistical software (see Table of Materials) for analysis of significance. An optimally dried ITO slide will result in a flat desiccated sample with minimal to no wrinkles across the surface of the agarose and agarose pieces that maintain spatial separation on the slide (Figure 3). Figure 3A shows optimal drying, while Figure 3B shows the wrinkles that should be avoided. This optimization requires careful monitoring of the slide in the oven, as exact times can vary based on the relative humidity. While wrinkles can slightly affect the height, and therefore the mass accuracy of the IMS signals, slight wrinkles will not impact the quality of the data. Therefore, any agarose that ultimately has slight wrinkles can still be analyzed via MALDI-TOF MS. The slide must be completely dried or this could lead to an explosion of the sample in the high vacuum environment of the MALDI-TOF mass spectrometer. Other substrates aside from agarose may work, but often times do not maintain their structural integrity upon drying or removal of the well chamber, which results in spreading across the ITO slide and loss of spatial information. For example, we have previously tested collagen as a substrate and this resulted in spreading and loss of spatial information when the well chamber was removed (data not shown). The tissue used should be in the center of the well if it is undivided, or in the center of the half triangle if it is divided, so that acquisition of IMS data is not contaminated with edge effects. 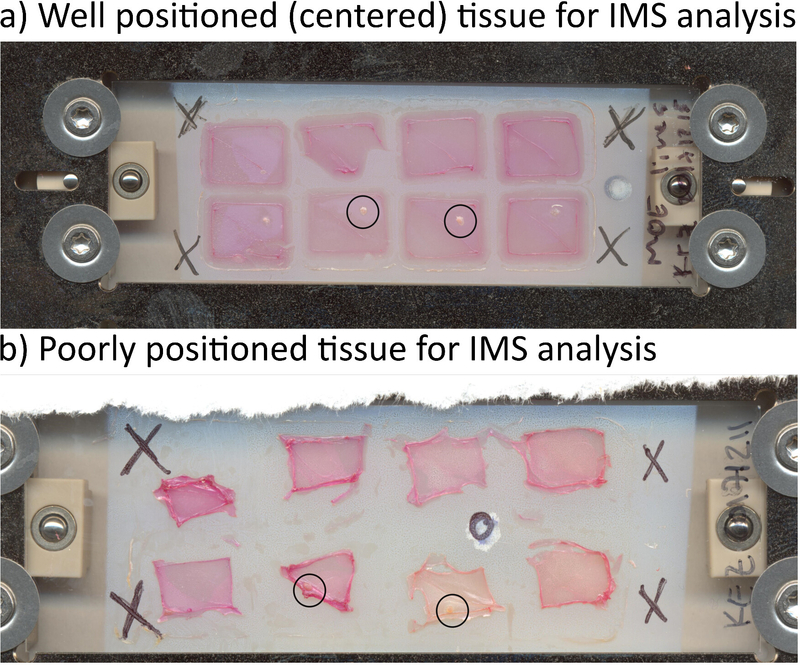 Figure 4 shows examples of optimally located tissue (panel A) and badly positioned tissue (panel B). In Figure 4B, the tissue is located on the edge of the agarose which, when imaged, may result is false mass signals from the edge effects, and does not allow users to image the agarose surrounding the tissue, which means that secreted signals may be missed during analysis. Tissue should be as close to the center as possible, as demonstrated in Figure 4A. A series of experiments determined that an 8-well chamber was the best vessel for incubation, as compared to a 6-well plate and a 24-well plate, because the 8-well chamber results in minimal perturbations to the cells, whereas the other larger chambers require agarose slabs to be transferred to an ITO or stainless steel slide following incubation16. The 8-well chambers from several brands of chamber slides can be used, but those with an adhesive rubber bottom and parallel sides of the wells facilitate easy introduction and removal of a plastic divider for the divided wells. The 6-well plate required much more material and faced difficulties with drying such large areas. The 24-well chamber also had problems during drying, because the meniscus effect was evident in the wells and therefore, the plugs dried with significantly higher edges. The 8-well chamber does not result in the meniscus effect when the agarose is plated directly in the center of the well, and agarose plugs do not have to be transferred. Additionally, the 8-well chamber allows for 8 conditions to be tested or controlled for in a single experiment. Depending on the experiment, it may be important to include controls such as (1) wells with no ovarian explants or cells, (2) wells with cells only, or (3) wells with ovarian explants only. Because the sample preparation (precise media and agarose concentration, matrix amount, etc.) differs slightly between runs, conditions should be compared when they are acquired on the same slide. Further experiments determined that an ITO-coated slide was the best platform for incubation when compared to a steel MALDI plate because the slide allows for visual verification of the cell state and positioning. For instance, using the ITO slide, we can verify that the cells have normal morphology and that they maintain homogenous distribution throughout the agarose prior to and following desiccation16. The slide will also allow for incorporation of fluorescent cell lines as needed. Additionally, removal of the chamber prior to desiccation is required to maintain the entirety of the agarose plug. If the slide is desiccated with the 8-well chamber adhered, the plastic pulls the agarose plug apart and results in major cracks in the plugs. Figure 5 demonstrates the problems faced when the chamber is not removed prior to drying. 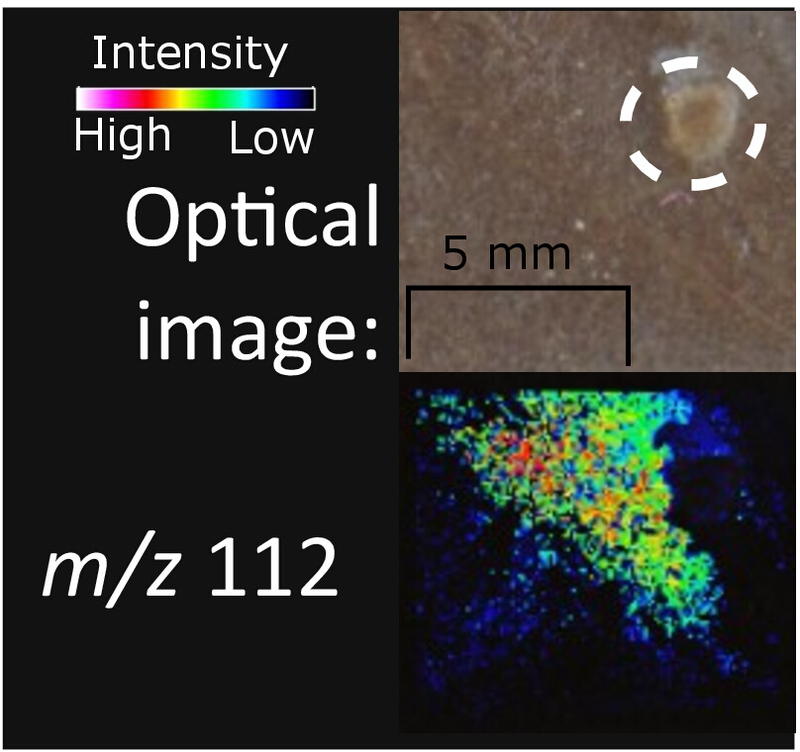 When analyzing cell populations, it is important that the spatial resolution is at least 50 µm to begin to capture the small size of the tissue and cellular interactions. With sprayed matrix, it is possible to achieve 5 µm resolution, but this lengthens the overall time to gather the mass spectrometry data while yielding comparable results. Spatial resolution is also dependent on the ability to focus the laser in the MALDI-TOF mass spectrometer. Overall, we have optimized this slide setup to best detect exchanged small molecules in coculture. Therefore, during data analysis we are seeking molecular features that are only present or are significantly more abundant in an agarose plug that represents the biological condition of interest. Because there is the option to include seven other controls and conditions on the slide, this can be achieved visually and by the aid of statistical software designed for IMS data. Our dereplication process following the detection of spatially relevant masses is extensive so that we can orthogonally obtain a high-resolution mass and fragmentation data. The first step that we take for dereplication is a search of the nominal mass through a database, such as the Human Metabolome Database (HMDB) for mammalian metabolites. Most of the molecules in the database have a significant number of spectra covering many techniques for comparison to experimental data. Once nominal masses have potential candidate molecules as their putative identity, it is often possible to compare physical data such as MS/MS fragmentation, UV profile, and retention time between the candidate structure and a standard. For example, identification of norepinephrine in the coculture of tumorigenic FTE cells incubated with ovarian tissue has validated that this IMS method is capable of detecting relevant small molecules from this system16. Figure 6 depicts the sensitivity of the IMS runs, showing the type of data one may expect by following the protocol for undivided chambers. Figure 7 similarly shows representative data for the divided chamber setup. Figure 1: Workflow for sample preparation of undivided coculture. (A) Adhere 8-well chamber to conductive side of ITO-coated slide. (B) Place halved ovaries in center of wells for coculture conditions. (C) Add 300 µL of agarose/cell suspension directly into wells. Make sure there are no air bubbles and that the ovary remains in the center of the well. If the pipetted agarose disturbed the ovary, gently use the pipet tip to center it before the agarose cools. (D) After four days of incubation (or otherwise optimized time) remove 8-well chamber from slide. If agarose remains attached to chamber, gently detach agarose plug from chamber using a spatula and reposition it on the slide. The agarose will not adhere to the slide, so it will be easy to move. Draw an ‘X’ on each corner of the slide and take a photo. (E) Dry the slide in a 37 °C oven for 4 h, rotating 90° each hour. Agarose should be fully desiccated and should lie flat on the slide. (F) Apply matrix of choice via a sprayer or airbrush to slide. Matrix layer should be visible as yellow. Scan the slide on a scanner at 1,200 dpi and add calibrants or standards for MALDI-TOF MS analysis. Please click here to view a larger version of this figure. Figure 2: Workflow for sample preparation of divided coculture. (A) Cut tabs out of media basin (~13 mm) and ensure that sides are straight. (B) Attach 8-well chamber to conductive side of ITO-coated slide. (C) Insert dividers diagonally into wells. (D) Add 150 µL cell culture in agarose to one side of divider, allow agarose to cool, and remove divider. (E) Add ovary to center of empty well half and cover with 150 µL of media and agarose suspension. This figure reproduced with permission from Zink et al. 201816. Please click here to view a larger version of this figure. Figure 3: Wrinkles in agarose plugs. 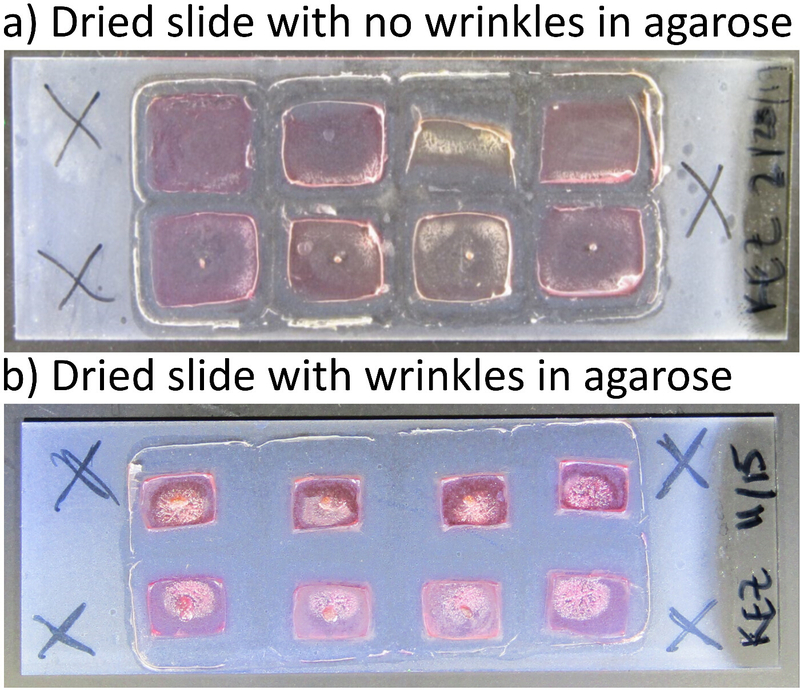 Wrinkles can form in the agarose plugs if the slide is left in the oven for too long. This will not preclude the sample from MALDI-TOF MS analysis but may affect the quality of data. (A) Image of an optimally dried slide. All of the agarose surrounding the ovarian tissue is completely flat and free of wrinkles, providing ample area for IMS analysis. (B) Image of a poorly dried slide with wrinkled agarose throughout the sample. This figure reproduced with permission from Zink et al. 201816. Please click here to view a larger version of this figure. Figure 4: Positioning of tissue. Position of tissue in dried sample is very important for data acquisition. (A) Dried agarose plugs of divided chambers show the ovary in the center of one half of the well, which is optimal for imaging. (B) Dried agarose plugs of divided chamber where ovary was not centered for incubation or drying. The ovarian tissue dried on the perimeter of the agarose plugs, and therefore cannot be analyzed. Please click here to view a larger version of this figure. Figure 5: Drying slides with the chamber. When the slide is set in the oven prior to chamber removal, the agarose plugs adhere more strongly to the plastic than to themselves and begin to pull apart in the heat. This results in severe cracks in the agarose, and little adhesion to the slide itself. Cracks this large are not conducive to IMS analysis. Top: Slide after 2 h desiccation with 8-well chamber adhered. All agarose plugs but two cracked through the center due to adhesion to the 8-well chamber. Bottom: Slide after removal of 8-well chamber. Only one agarose plug remained on the slide. This figure reproduced with permission from Zink et al. 201816. Please click here to view a larger version of this figure. Figure 6: Detecting unique signals. When comparing 8 conditions, it is possible to detect signals that are unique to one single condition. (A) The dried slide image is used to teach the MALDI-TOF mass spectrometer which regions to image. Here we have selected small regions around the ovarian tissue for IMS at 50 µm. (B) A representative image of a m/z signal that is upregulated in one condition versus all eight on the same slide. Please click here to view a larger version of this figure. Figure 7: Representative data from divided chamber setup. Ovarian tissue is outlined in white. The m/z 112 is secreted from the half of the well containing the ovary. IMS was performed at 50 µm. This figure reproduced with permission from Zink et al. 201816. Please click here to view a larger version of this figure. There is a growing body of evidence that implicates norepinephrine’s role in HGSOC12,17,18, and this technique has contributed more mechanistic information. With at least eight biological conditions present on the same slide, the method can account for biological controls such as gene and cell specificity as well as media controls in a single IMS run. While the method was optimized to evaluate exchanged small molecules in a model of primary metastasis in HGSOC, any cell or tissue type that can be placed in agarose can be substituted to analyze a wide variety of biological questions and disease states. One of the most important steps in the protocol is ensuring that the tissue or cell types are in close proximity to one another and are present in the center of the agarose plug. Another important consideration is optimization of the drying time for the entire slide. This method was optimized using ovarian tissue, which dried easily and whose small size resulted in little drying complications. However, other tissues, with different composition such as fat, have very different drying profiles and therefore require more extensive desiccation optimization. After drying has been optimized for the biological sample, the remaining workflow should require only minimal alteration. During mass spectral acquisition, it is likely that many projects will require the analysis of compound groups other than small molecules. The IMS parameters for acquisition and the selection of matrix, therefore, should be adapted to generate the best data for the respective target, if it is known. Additionally, we only have performed data acquisition in positive mode with a 50:50 CHCA:DHB matrix, but negative mode experiments may prefer a different type of matrix, and larger molecules would be more easily detected in a different matrix as well. The method can be used with a wide mass range in an untargeted approach or with a narrower mass range for a targeted search. In the case of the above discussed method, small molecules were the target of interest because the focus was to detect molecules that were exchanged through the agarose between cell and tissue representatives. Although we cannot claim the limitations in terms of size and structure that inhibit movement through agarose, our aim was to detect small molecules, so our matrix decision and MALDI-TOF MS parameters were optimized for that goal. Future experiments are being developed to target lipids and proteins that may have been missed in our original acquisition method. In addition to the limitation of compound class detection, this method also requires that the cells be compatible with agarose, and that the tissue sample (if used) be adapted to fit into an eight-well chamber. Certain tissues can be adapted to larger wells if fewer biological conditions are required for comparison, but it is crucial that the selected tissue is capable of drying to a uniform height of less than 100 to 200 µm after desiccation4. Multiple biological samples could be evaluated such as more than one cell type in communication with a tissue. Because the sample preparation is able to spatially separate agarose-based cell cultures, it is possible to assign visualized m/z's to the cell culture source based on observed diffusion patterns. Using IMS to study tissue sections from human samples or transgenic mouse models recapitulates the complexity of tissues. However, human samples are difficult to obtain, which can dramatically limit the ability to study things like disease progression. Tissue from transgenic mouse models can be collected at well-defined time points. But, mouse models can be time consuming and expensive to develop. In addition, the full complexity of real tissues in both of these models can make it difficult to accurately evaluate communication between specific cells or tissues. In contrast, the method presented here is a highly adaptable. Different tissues or cell lines can be cocultured on the same slide to examine differences in communication. For example, normal cells or tumor cells from the same tissue can be cultured on the same slide to understand differences due to transformation. Time course studies may uncover novel signaling cascades between cells, or small molecule inhibitors and/or RNAi could be incorporated to examine the role of specific signaling molecules or metabolites. We believe these possibilities will make this technique useful for studying cell-to-cell communication in a wide variety of contexts. Funding was provided by the Chicago Biomedical Consortium with support from the Searle Funds at The Chicago Community Trust (C-076) (L.M.S. ); University of Illinois at Chicago Startup Funds (L.M.S. ); Grant 543296 from the Ovarian Cancer Research Fund Alliance (M.D. ); and UG3 ES029073 (J.E.B.) and by the National Center for Advancing Translational Sciences, National Institute of Health, through grant UL1TR002003 (JEB & LMS). Paine, M. R., et al. Whole Reproductive System Non-Negative Matrix Factorization Mass Spectrometry Imaging of an Early-Stage Ovarian Cancer Mouse Model. PLoS One. 11, (5), e0154837 (2016). Yang, Y. L., Xu, Y., Straight, P., Dorrestein, P. C. Translating Metabolic Exchange with Imaging Mass Spectrometry. Nature Chemical Biology. 5, (12), 885-887 (2009). Li, H., Hummon, A. B. Imaging Mass Spectrometry of Three-Dimensional Cell Culture Systems. Analytical Chemistry. 83, (22), 8794-8801 (2011). Yang, J. Y., et al. Primer on Agar-Based Microbial Imaging Mass Spectrometry. Journal of Bacteriology. 194, (22), 6023-6028 (2012). Coscia, F., et al. Integrative Proteomic Profiling of Ovarian Cancer Cell Lines Reveals Precursor Cell Associated Proteins and Functional Status. Nature Communications. 7, 12645 (2016). Labidi-Galy, S. I., et al. High Grade Serous Ovarian Carcinomas Originate in the Fallopian Tube. Nature Communications. 8, (1), (2018). Klinkebiel, D., Zhang, W., Akers, S. N., Odunsi, K., Karpf, A. R. DNA Methylome Analyses Implicate Fallopian Tube Epithelia as the Origin for High-Grade Serous Ovarian Cancer. Molecular Cancer Research. 14, (9), 787-794 (2016). Falconer, H., Yin, L., Gronberg, H., Altman, D. Ovarian Cancer Risk After Salpingectomy: A Nationwide Population-Based Study. JNCI Journal of the National Cancer Institute. 107, (2), dju410 (2015). Dean, M., Davis, D. A., Burdette, J. E. Activin A Stimulates Migration of the Fallopian Tube Epithelium, an Origin of High-Grade Serous Ovarian Cancer, through Non-Canonical Signaling. Cancer Letters. 391, 114-124 (2017). King, S. M., Burdette, J. E. Evaluating the Progenitor Cells of Ovarian Cancer: Analysis of Current Animal Models. BMB Reports. 44, (7), 435 (2011). Reznik, E., et al. Landscape of Metabolic Variation across Tumor Types. Cell Systems. 6, (3), 301-313 (2018). Watkins, J. L., et al. Clinical Impact of Selective and Nonselective Beta-Blockers on Survival in Patients with Ovarian Cancer: Beta-Blockers and Ovarian Cancer Survival. Cancer. 121, (19), 3444-3451 (2015). Lutgendorf, S. K., et al. Stress-Related Mediators Stimulate Vascular Endothelial Growth Factor Secretion by Two Ovarian Cancer Cell Lines. Clinical Cancer Research. 9, (12), 4514-4521 (2003). Sood, A. K. Stress Hormone-Mediated Invasion of Ovarian Cancer Cells. Clinical Cancer Research. 12, (2), 369-375 (2006). Hoffmann, T., Dorrestein, P. C. Homogeneous Matrix Deposition on Dried Agar for MALDI Imaging Mass Spectrometry of Microbial Cultures. Journal of The American Society for Mass Spectrometry. 26, (11), 1959-1962 (2015). Zink, K. E., Dean, M., Burdette, J. E., Sanchez, L. M. Imaging Mass Spectrometry Reveals Crosstalk between the Fallopian Tube and the Ovary That Drives Primary Metastasis of Ovarian Cancer. ACS Central Science. 4, (10), 1360-1370 (2018). Armaiz-Pena, G. N., et al. Src Activation by β-Adrenoreceptors Is a Key Switch for Tumour Metastasis. Nature Communications. 4, 1403 (2013). Choi, M. J., et al. HTERT Mediates Norepinephrine-Induced Slug Expression and Ovarian Cancer Aggressiveness. Oncogene. 34, (26), 3402 (2015).